From birth, the baby's digestion learns to process the intake of nutrients that enter the body through food. However, the baby's digestive system is still in the development stage, making it susceptible to baby stomach pain. Vomiting in infants is the most common sign of digestive problems. Usually, the symptoms begin with a sudden vomiting and can also be accompanied by fever or diarrhea. During this time the smallest desire to eat or drink milk will be reduced. If the mother feels less likely to change the diaper, it could be the child has entered the stage of dehydration. However, it is necessary to distinguish vomiting with spit. Have you ever seen your baby vomit after eating or drinking milk? it could be that it is a symptom of reflux in infants. This condition is caused by the work of the baby's digestive system is not perfect, so that stomach acid can rise and food in the stomach pushed out into the throat. Colic is a contraction of the intestine that infuses the baby's abdominal pain. Colic is actually common in infants, characterized by crying loudly and lasts for more than 3 hours. In addition to crying, colic is generally more pronounced in the afternoon or early morning. This condition will improve after the baby reaches the age of 3-4 months and will disappear after past the age of 5 months. 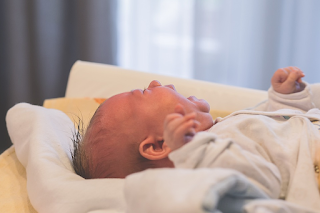 In infants, flatulence can be caused by air entering and trapped in the gastrointestinal tract, or gas formed in the gastrointestinal tract as it digests food. Crying and use of a bottle of milk may also increase the risk of flatulence. If your baby looks restless and the air seems full, it may be due to air or gas in the digestive tract. Diarrhea in infants is generally caused by a viral infection, the rotavirus. This happens when a baby is exposed to something contaminated by a virus, especially through food or drink. When the child has diarrhea, the most important thing that the mother has to do is to make sure she is not short of fluids, to avoid dehydration. Digestive problems in infants are quite common, so it is important for the mother to know how to deal with baby stomach problems according to the condition of the child. To overcome vomiting and diarrhea, replace the lost fluids by giving them little by little drinking water. Give a drink every 10 - 15 minutes using a spoon or bottle. This helps prevent your newborn that have stomach problems from becoming dehydrated. Although generally colic improves when the baby ages 3 - 4 months, Mother can try to calm down by wiggling the baby's body while carrying it on the shoulder. Bathe in warm water and gently massage the stomach. Then feed the baby in an upright state. The same way can also be done when the baby experiencing reflux and flatulence. If you see the child's stool looks hard and dry, or he looks difficult bowel movements, chances are he had constipation. Try to reduce solid foods for 1-2 days, and provide soft foods, and increase fluid intake. When using a given formula is the cause of constipation or diarrhea, you should reduce the first milk delivery and consult a doctor for baby stomach ache.